"This is an American rendition of a British classic. Serve with your choice of savory or sweet toppings, like fruit spread and butter, double Devonshire cream, clotted cream, etc... I love using crumpets as a base for eggs Benedict. If you have an Instant Pot® you can use the yogurt setting and proof the dough much faster!" In a microwave-safe bowl, heat buttermilk and 1/2 cup milk to about 100 degrees F (37 degrees C). Sprinkle yeast and sugar over milk mixture, stirring once. Let stand until yeast softens and begins to form a creamy foam, about 10 minutes. Combine flour and salt in a large bowl. Add yeast mixture and stir to combine, forming a soft dough. Cover and place in a warm place for 40 minutes or until doubled in size. Combine remaining 1/2 cup milk and baking soda in a small bowl. Stir mixture into dough until incorporated. Cover and leave for 30 minutes in a warm place. Heat a cast iron pan or griddle over low heat. Spray metal crumpet rings and place into middle of frying pan. 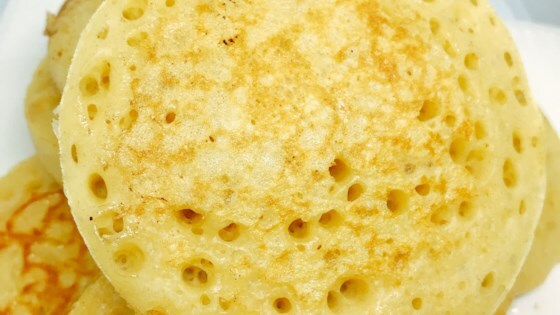 Fill each ring with 1/2 cup of crumpet mixture. Cook for 4 or 5 minutes until bubbles appear and the edges are starting to set. Remove from ring and cook the top for 2 minutes or until lightly browned. Cool on a wire rack. Using buttermilk gives these pancakes a nice tang and makes them fluffy. These were ALMOST as perfect as the real ones I've been missing from Australia! I will make them again. I wish there was a recipe for these using the Instant Pot.